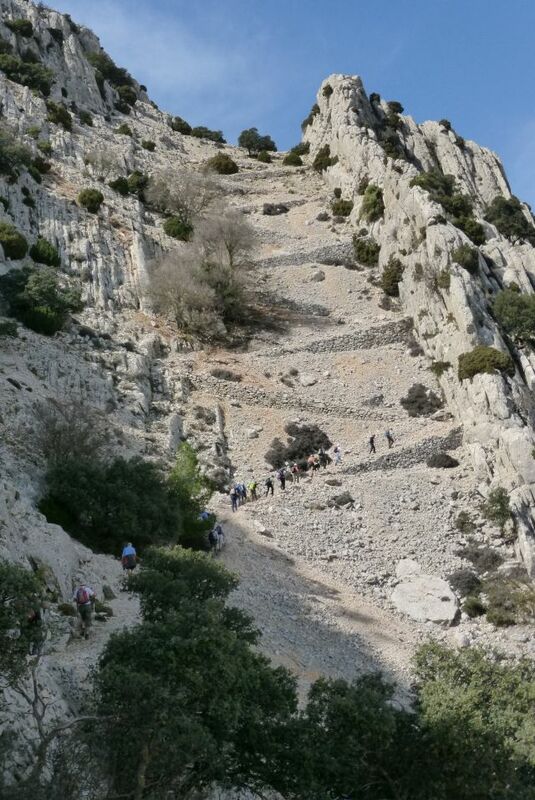 The Costa Blanca Mountain Walkers (CBMW) is a group of people who get together twice a week to enjoy walking in the mountains of the Costa Blanca region of Spain. Walkers who act as leaders are not formally trained or registered and take no responsibility for their companions You walk at your own risk. Whilst every effort is made to ensure accuracy, the time stated for each walk will always depend on the fitness and ability of the walkers and also the conditions on the day of the walk. We are not a registered/affiliated club and therefore have no membership, subscriptions or rules. We do however ask everyone who walks with us to make an annual voluntary contribution towards the cost of our websites. This year’s contribution (2018/19) is 1 Euros per person. A key ring with our logo will be given to those that contribute by way of both a receipt and a thank you. These can be attached to your rucksack should you wish. We do however have a short list of Conventions which act as guidelines and hopefully are an aid to walkers and leaders alike. Everyone is required to read our Conventions as a condition for walking with us and for downloading each season’s programme. A walking programme is produced for the Autumn (Oct-Jan) and Spring (Feb-May). The aim is to give walkers a varied programme through the walking season and enough walks in each grade to satisfy all walkers. You will normally find at least 3 walks every Wednesday and Saturday except around Christmas and New Year. We would always welcome comments on the programme at admin@cbmwalkers.org . You can download the programme here, however, you are advised to ensure that you have checked the stop-press on the front page of the website prior to setting out for a walk in case there have been any last minute changes. There is some guidance on what to bring on a walk in the conventions and you will probably have your own views on what you need and do not need. A comprehensive checklist can be found by clicking here where you will find a list of things that you can pick and choose depending on the weather, the season, the forecast and the severity of the walk. If you need further advice you can receive this by either contacting the walk leader whose details are available on the programme by requesting advice from admin@cbmwalkers.org . The walks are all graded according to distance, height gained and terrain throughout the walk. This is a fairly rough guide and the severity of the walk will change with weather conditions which you should take into account when deciding about which walk to attend. The walk grades can be found by clicking here. Walks in Spain (WiS) is the CBMW website where there is information about many of the walks that we organise throughout the season. There are additional walks included from other areas outside our normal walking area which have been gathered during our various walking trips away from the Costa Blanca. These are freely available for all to use but are not intended for use by organisations that make charges to their clients. Each walk described has a written description, GPS file available to download and in most cases a few pictures to illustrate the route. The walk description can be downloaded and printed. This has a detailed description of the route with step by step instructions and also has a map with the route on it. If you are walking on your own then you can use this as a guide. There is also a data file attached to the description which can be downloaded and used with a GPS receiver. All routes are available for individual use and not for use by walking groups. Anyone using the information from WiS does so at their own risk. We cannot be held responsible for the accuracy of the information. The website can be found by clicking here. There are normally a couple of trips a year arranged for the CBMW. These will normally be published on the website and will be filled on a ‘first come first served’ basis. There will normally be a reserve list to ensure no places are wasted. The trips are organised and led by volunteers and will normally be excellent value for money. Keep your eyes on the website for information about up and coming trips. The latest information can be found here. It is very easy to forget when walking on the Costa Blanca, that the mountains can be a challenging place. The normal dangers of dehydration and exposure as well as accidents from sprains, breaks and falls, still occur. When walking with the CBMW you do so on the understanding that you do so at your own risk, however, we do endeavour to make all walks as safe as possible and whilst most leaders are not formally trained they are experienced at walking the routes that they will take you on. To help you remain safe both when walking with the CBMW and on your own, we have put together some advice on safety in the mountains which you are advised to read. This can be found by clicking here. We recommend that individuals who walk with us take out insurance cover for rescue and medical costs in case of an accident on our mountain walks. Those who are Spanish resident or visitors who wish to have additional cover can take out extra insurance via www.femecv.com (In Spanish) or www.aacuk.org.uk (In English). If you are just visiting the area on holiday then you should check that your travel insurance cover is sufficient and that you have an EHIC card – if not take out extra cover! When walking ensure that you have your Spanish SIP/EHIC and/or insurance with you as this will be required should you have to be taken to a hospital. You should check the Walking Programme to see whether dogs are allowed on the walk that you are planning to take. If dogs are allowed then they should be kept on leads at all times and should be kept at the rear of the walking group to avoid tripping up fellow walkers. You should be aware that during the hunting season dogs can be shot and trapped by hunters and can also be poisoned by fox bait (strychnine). This has also been known to be injected into sausages and placed in scrub and even on tracks.